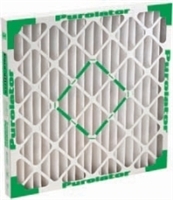 Purolator’s PAF 11 filters are medium-efficiency, extended surface, pleated air filters. The Puro-green 13’s heavy duty beverage board frame is made using moisture-resistant, sturdy frame material that stands up to rough handling and difficult service conditions. Watch out—your horrible, hacking cough may not be a simple side effect of the flu. If you aren’t vigilant, harmful contaminants can creep into your family’s filtration system and wreak havoc on your unsuspecting lungs. Thankfully, our pleated filters are designed to eliminate pollutants like dog hair, pollen microspores, mold and more from your indoor air. Constantly swapping out filters can be frustrating, but pleated filters offer extended surface area for extra dust-holding capacity. This innovative design feature increases the longevity of the filter’s utility and maximizes efficiency, saving you time and money. When you switch to Quality MERV rated filters, you’ll breathe easier, save time and cut costs. If you have questions about selecting the correct filter for your home or business, contact us and we’ll find a product that meets your specifications. Order now for unbeatable prices and fast shipping!